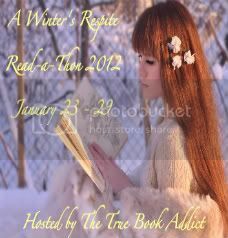 Through CMash loves to Read, I've come to know of a Readathon in January being hosted by the true book addict. The week long event has mini-challenges, giveaways, and a lot of reading. Since I had great fun in the readathons I participated in last year, I am signing up for this too. Hi! Thanks for asking about the Borrowed Book Challenge!! I couldn't figure out how I wanted to set it up so I haven't made a post about it yet. I will set something up asap and let you know where you can link up!! Thanks La Toya for the reply. Looking forward to the post. Glad you're joining me this week for the read-a-thon. Just wanted to remind you to be sure to sign in at the starting line when you start reading. The post will be up at midnight tonight (Monday, 1/23 at 12:00am CST U.S. time) Have fun reading!